Summer break will start in the next few weeks. Some parents have already rushed to sign up their children for activities, everything from summer school and sports, to drama, gymnastics, aquatics, and summer fun. But don’t be in such a hurry to plan extracurricular activities for your children, grandchildren, nieces, and nephews – there’s a lot that you can do at home. I like projects that combine creativity and family time. You don’t have to be crafty or come up with elaborate projects, but there are things we can do to get the kids interested and make family-time interesting. 1. Create a time capsule. Invite people to write letters, photographs, and small souvenirs or mementos. You can host a time capsule party with friends and clubs, or just keep it in the family. You don’t have to bury it or even use a fancy container. Just choose a water-tight capsule that you can seal with hot glue or epoxy and find a safe place for it. Decide when you will open the time capsule, whether it’s five years, ten years, or longer. I’ve put together two time capsules in my life, both of them still unopened and waiting to be rediscovered. 2. Start a family recipe book. Make a list of all the special dishes that your family loves – even the ones that seem ordinary or that you don’t make yourself. Take photos of each dish, and include notes about brands, substitutions, and variations. Write down the history of the food and any memories you have of family get-togethers or special occasions. My grandfather used to make Korean mandoo every new year, and now my dad has taken over the tradition with different ingredients. 3. Ask elders to tell you stories. Listen to their stories about when they were young and the people, places, and events they remember. Audio or video recordings are a great way to capture their personalities and emotions. Scan older photographs or negatives so that you don’t have to worry about the originals getting lost or damaged. I cherish my grandmother’s reminiscences and every now and then just listen to her voice. 4. Write a letter to your future self. Write down what is important to you now, what you hope to accomplish, what you expect your life to be like, and any reminders (or admonishments) you think are important. You may feel self-conscious, but it’s worth it. I don’t have any letters that I wrote to myself from when I was a child, but I wish I did! 5. Write a story with a child. Use your imaginations to create a fairy tale, adventure story, or mystery. Work together to come up with the characters, setting, and plot. Decide whether you will illustrate the story with photographs, drawings, or paintings. I suggest planning for 20 8”x8” pages (including a title page), if you want to get a professional photobook printed. If writing fiction intimidates you, try writing a joke book or a comic book, or put together a school or vacation scrapbook. If you want to go digital, make a short movie or “funniest videos” montage. Let your imagination and sense of humor take over! When my son was 5 years old, I wrote a rhyming book for him, and even created a counting poster by duplicating his photos. This summer, I told my son that we’ll write a book together, with words and pictures (or photos). What will you do with your family this summer? Please share your projects with us! My son is a bike rider, but I never learned how to ride a bicycle. When I was a kid, I didn’t leave the driveway on my bike, and my parents never even took off the training wheels. My 7-year old son’s biking experience is vastly different: within two weeks, we took the training wheels off his bike, he practiced riding, and he proceeded to bike confidently around the basketball court. Hawaii is working hard to make our cities more bikeable, with a Bike Plan Hawaii Master Plan. We are adding bike lanes, installing sidewalk bike racks, equipping city buses with bike racks, designing “Safe Routes to School,” and encouraging “Bike to School/Work” days. Companies are starting up bike-sharing businesses. Hawaii is also educating bike riders. We teach bikers and drivers about sharing the road – there’s a helpful “Sharing the Road: A Guide to Safe Bicycling in Hawaii” brochure. The Hawaii Bicycling League offers cycling workshops about how to balance, the rules of the road, and bike maintenance. 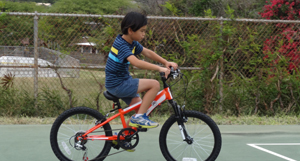 We even have BikeEd Hawaii, a bicycle safety program for fourth graders on Oahu, to teach kids about helmet safety, bicycle “safety checks,” and how to bike on the road. Hawaii has everything in place – safety programs, bike lanes, and bike parking – but not all parents can afford to buy a bicycle or have the time (or know-how) to teach bike riding to their kids. * Bike-riding class in elementary school. Schools could offer a class on bike-riding (maybe as part of the PE program) to teach kids how to ride a bicycle. They could ask for donations from the community and work with Parent-Teacher organizations for funding and volunteers. * After-school bike-riding class. Schools or neighborhood parks could offer an after-school bike-riding class, with bicycles donated to or purchased for the school. * Bike-riding class in Summer Fun. During the 8-week Summer Fun program, the Department of Parks and Recreation could spend a week at each park, bringing bikes and teaching kids how to ride. * Summer bike and swim program. Every summer, the American Red Cross offers free swimming lessons at Ala Moana Beach Park. They could partner with a non-profit bike group or expand the program to include bike riding. They could even start a keiki “Aquabike,” a swim/bike combination race. * Bike-riding pride. After completing a bike-riding class, students could show off their skills with a bike parade around the school or participate in a bike-decorating contest. Here’s another suggestion: Fitness clubs with exercise bikes could host bike-and-read events, open to the general public, where teens and adults could read while they bike. It’s not exactly learning how to bike, but it would strengthen leg muscles and brain-power! May 16 is Bike to Work Day on Oahu and May 18 is Bike to the Zoo Day in Honolulu. Do you bike to school or work? How do you think we can encourage biking in our community? 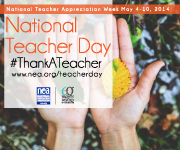 On May 6, we honor our teachers on National Teacher Day. It’s a week to thank our teachers, past and present, and think about all the ways they touched our lives. Some of my most memorable teachers were also the toughest. Thank you, Ms. Foster, who juggled a combined fifth and sixth grade class, who taught us about money (by setting up the Foster Bank) and gave us daily writing assignments. I remember writing “serial” stories with daily cliffhangers that took the whole week to finish. Thank you, Mr. Tiffany, who taught speech class with passion and precision (and volume). Thank you, Mrs. Woliver, who had so much creativity and enthusiasm about writing. She asked us to keep a dream journal and had us write conversations with our body (I thought it was odd at the time) and significant people (like Shakespeare). Thank you, Ms. Powers, my AP English teacher, who had high expectations and set high standards for our work. I was happy to survive her class. * Appreciation notes. In Kindergarten, he wrote small notes for his teacher. “I like your class!” he wrote, and “I like your attention.” He decorated the notes with stickers and we bound it into a booklet. Mrs. J. is a good teacher! 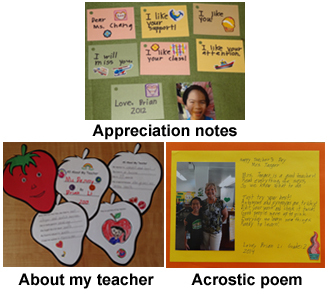 If you’re looking for more inexpensive and crafty ideas, check out Spoonful’s “26 Gift Ideas to Thank a Teacher” (one of my favorites is the “Thanks a latte” card) and Skip to My Lou’s “Teacher Appreciation Gift Ideas” (I especially like the “You’re the best SUB ever!” with Subway gift card idea). Who were your favorite teachers? Which teachers had the biggest impact on your life? What do you wish you could tell them? Imagine that you live in country where everyone speaks another language, one that constantly changes so that you never become fluent in it. Imagine that time is fluid, that you have a hard time distinguishing things that happened today and two weeks ago. Imagine that you can’t control your emotions – your feelings, both painful and joyful, are just as strong now as when they happened. This is the life that Naoki Higashida lives. He was born in 1992 in Japan and diagnosed with autism when he was 5 years old. At age 13, communicating painstakingly with an alphabet grid, Higashida answered 58 questions about his daily life. 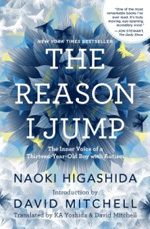 His answers are collected in “The Reason I Jump: The Inner Voice of a Thirteen-Year Old Boy with Autism” (2007), and translated from Japanese to English in 2013 by KA Yoshida and David Mitchell. For Higashida, the worst thing about autism is “you have no idea quite how miserable we are… We can put up with our own hardships okay, but the thought that our lives are the source of other people’s unhappiness, that’s plain unbearable.” But he also sees the positive side of autism: to him, “Every single thing has its own unique beauty. People with autism get to cherish this beauty.” He is fascinated and soothed by nature and being outdoors with living things. People with autism help others remember what truly matters in our selfish and often violent world. “The Reason I Jump” showed me that people with autism have the same need to be understood, creativity, and ability to love that we all feel, even though they express it differently – or are unable to express it. I feel a new patience and understanding for people with autism; since they can’t communicate in the same way with us, we need to change the way we interact with them. Why does Higashida jump? Jumping expresses his happiness and gives him a feeling of weightlessness. “My urge to be swallowed up by the sky is enough to make my heart quiver.” He adds, “So by jumping up and down, it’s as if I’m shaking loose the ropes that are tying up my body.” Today, Higashida is a blogger, author, and activism advocate. You are currently browsing the Better Hawaii weblog archives for May 2014.